I love the intense flavour that bananas take on when they're roasted and start to caramelise, and the touch of orange in the crème fraîche really brightens the whole dish. Preheat oven to 180C fan bake. Line a baking tray with baking paper. Cut the butter into cubes and place in a small saucepan over low heat. Melt the butter, then take off the heat and stir in the sugar until it is completely dissolved. Pour the butter and sugar mixture immediately into the lined baking tray. Peel the bananas, halve them lengthways, and lay them carefully on top of the caramel, cut side down. Dust over the cinnamon. Place in the oven and bake for 20-25 minutes. Meanwhile, combine the crème fraîche with the orange zest and toasted coconut. 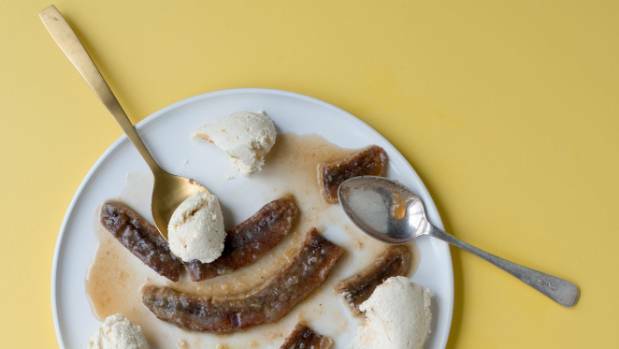 Once the bananas are soft and caramelised, plate them up carefully with a generous dollop of the crème fraîche. Eat immediately!